Our Wingate by Wyndham Erlanger, KY / Cincinnati Area hotel is perfect for business or pleasure. 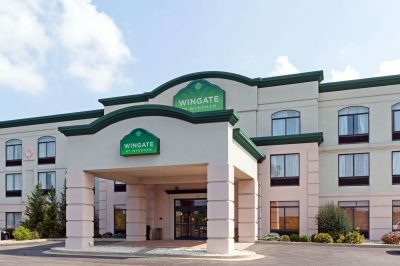 Centrally located just 15 minutes from downtown Cincinnati off I-71/I-75 and I-275, our hotel near St. Elizabeth Florence Healthcare and Cincinnati-Northern Kentucky International Airport gives you easy access to local businesses and attractions. Start each morning with a free hot breakfast, and plan your day using our free WiFi or Business Center. Forgot something or need a snack – visit our sundries shop. Get active with a workout in our fitness center and cool off in our indoor pool. Kick back and watch flat-screen TV in your spacious room. Go bargain hunting, explore exotic wildlife, or enjoy live sports. For a day of family fun, browse the shops, catch a movie, and visit the famous Newport Aquarium at nearby Newport. Spend some time in the heart of Cincinnati and view the exotic wildlife at the Cincinnati Zoo. See the Reds on the diamond at Great American Ballpark or watch the Bengals on the gridiron at Paul Brown Stadium, just 10 miles away. Visit Ark Encounter about 20 miles away or nearby Creation Museum. Enjoy a night on the town and try your luck on the gaming tables at Hollywood Casino. Click the "book now" to book your own room! To book by phone, please contact DAT Travel at 330-614-7219.